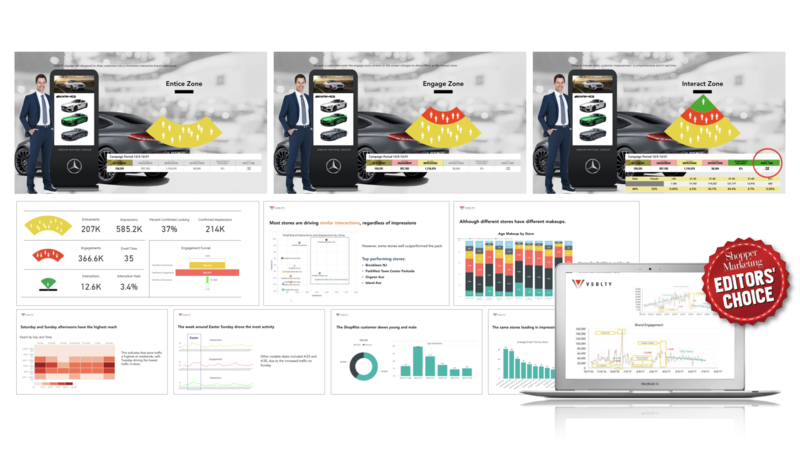 VSBLTY is changing the face of measurement with machine learning and artificial intelligence. The power of “full-circle” measurement is now possible in any physical location, in real-time, using VSBLTY’s unique machine learning through computer vision. Utilizing advanced optics and sensor technology, all elements of the Path To Purchase are measured by the DataCaptor™ software module, providing objective, real-time, qualitative measurement and analysis in retail and other spaces. All recurring visitors are supported with full anonymity unless they have opted-in. Using the VisionCaptor™ software module in conjunction with DataCaptor™, retailers have the power to provide interactive brand messaging based on who a camera “sees”. Using Edge and/or cloud-enabled digital display solutions, retailers can enhance guest experience with proximity-aware, interactive brand messaging triggered by demographic, identity or even sentiment, while simultaneously gaining groundbreaking levels of measurement and actionable insights. With the addition of advanced Facial and Object Recognition through VSBLTY VECTOR™, guest measurement comes full-circle. VECTOR’s Facial Recognition enables opted-in consumers to receive personalized messaging based on identity. This means truly comprehensive analytics delivered directly from a physical space to brands and retailers, in real-time, telling the entire story of the customer journey. This means surpassing what is capable in the world of online, and where it really counts: at the moment of decision. This means breakthrough analytics with virtually limitless applications. VSBLTY’s object recognition software will assist retailers and brands in a variety of other areas, such as with critical inventory and replenishment analytics using computer vision to identify objects at time of conversion. VECTOR‘s industry-leading cognitive APIs enable advanced recognition for faces and other advanced image analytics that are crucial to enhancing today’s security capabilities. All data registered by VSBLTY’s DataCaptor™ software module is fully anonymized and conforms with federal and state privacy laws. DataCaptor™ can be used in conjunction with VisionCaptor™ (VSBLTY’s CMS), or it can interface with foreign CMS software platforms and be used solely as the analytics and measurement component.